From her earliest memories of growing up in South St. Paul, Minnesota, Jeanne Minder has been active. Her love for moving, whether through biking, running, swimming, walking, skiing, or you-name-it, has led to impressive accomplishments in triathlon. Following is Jeanne’s triathlon story and information about triathlon training for seniors that she shared with Joy and me over coffee. I was first introduced to Jeanne through an article in an online newspaper covering the northern suburbs of St. Paul, Minnesota. However, when Joy and I met with Jeanne over coffee and tea at the Caribou Coffee in Arden Hills, Minnesota, we learned a whole lot more about her. And, an on-going participant in endurance events involving running, skiing, and biking. But that’s not all. In talking with Jeanne, we were able to see her personal side – her passion for endurance sports and her love for helping people, especially seniors, “make fitness a lifestyle”. Jeanne did her first triathlon, the Turtleman Triathlon in Shoreview, Minnesota, in 1982. Like so many of us, she caught the ‘triathlon bug’ after completing her first. There was no turning back. But the seed for her triathlon excursion started years earlier. Jeanne credits much of her love for being active to her mother. Growing up in South St. Paul, Minnesota, Jeanne’s mother taught her and her three sisters how to manage without a second car. During the summer, they made the daily bike ride to the pool where they spent their afternoons. Swimming, biking, and running were a natural part of her lifestyle as a child. Even though she did not participate in organized sports in high school, the foundation for future activities had been built. Since 1982, Jeanne has done over 400 triathlons. These have included six Ironman distance races of which three have been at the Ironman World Championship in Kailua-Kona, Hawaii. Qualifying for Ironman Championships in Hawaii meant that she won her age group at qualifying Ironman triathlons in Lake Placid, New York; Cape Cod, Massachusetts; and Hilton Head, South Carolina. Along the way, she has amassed a large number of interesting stories. The first one which she shared during our conversation was from the Ironman Cape Cod. She has also completed 26 marathons. These have included the iconic Boston Marathon, the Twin Cities Marathon in Minneapolis-St. Paul, and Grandma’s Marathon in Duluth, Minnesota. On top of this, she has finished countless long distance bike rides across her home state of Minnesota (TRAM, Bike Across Minnesota, MS150), the Birkebeiner cross-country ski race, and bike rides across long stretches of the USA and Canada. And then, there was her 2015 first-place finish in women’s triathlon at the National Senior Games. A sampling of Jeanne Minder’s awards and recognition. 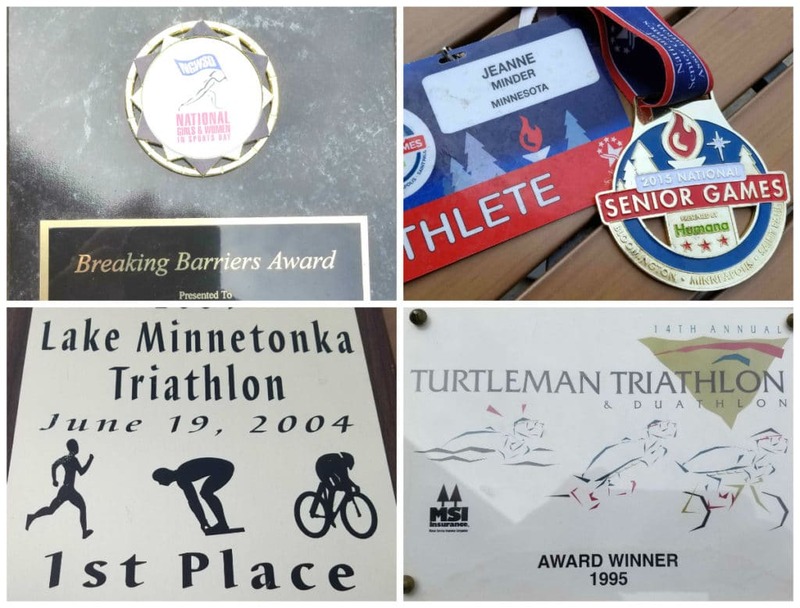 Clockwise from the upper left: 2018 ‘Breaking Barriers Award’ (upper left), finisher medal from the 2015 National Senior Games (upper right), the award from the 1995 Turtleman Triathlon (lower right), and the award from the 2004 Lake Minnetonka Triathlon. Despite this fantastic list of accomplishments, Jeanne told us that she was surprised to receive a call from a representative of the Minnesota Senior Sports Hall of Fame one day in early 2016. The caller informed Jeanne that her accomplishments had been noticed and that she had been nominated to the Hall of Fame. On May 13, 2016, Jeanne received the award recognizing her accomplishments in a ceremony at Jimmy’s Food & Drink in Vadnais Heights, Minnesota. Jeanne Minder was inducted to the Minnesota Senior Sports Hall of Fame on May 13, 2016. There are several approaches to training for a triathlon. These include self-training (developing a training plan on your own), training as part of a triathlon club, and training under either a virtual or live coach. While I have used self-training based on research and reading from a select group of books and websites, I have never been sure that this is the best approach or that it has helped me to be the most competitive. Since Jeanne has been a personal trainer for 28 years and is an accomplished triathlete, I decided to get her thoughts. Frankly, I expected that she would recommend hiring a trainer or triathlon coach. However, this has not been her approach nor one she recommended. In fact, I left feeling hopeful since she has followed a self-training approach with 2-3 group workouts per week. While triathlon is an individual sport, triathlon training provides plenty of opportunity for being social. There can be no question that one factor in Jeanne’s success is her love for being with people. She told us repeatedly of the thrills that have come from meeting and spending time with people, whether training together or camping at a multi-day biking event. If we are truthful, we all want to be competitive and even win some races, or at least finish in first place in our age group once in a while. However, most seniors who do triathlon or are active with other sports – Jeanne Minder included – mostly want to see others share in the benefits of being active. Not just as validation for their sports activities but because they (we) have seen the benefits of it. “Anybody who does a triathlon or any sport is doing good. As a personal trainer, I try to get people to work out three times per week and make it a lifestyle. On several occasions, Jeanne stopped to point out the importance of volunteers and race directors to triathlon. By the way, next time you are at a triathlon, thank the volunteers. Jeanne loves being with people. She has high energy and loves to be active. She also loves her dogs. Please send any questions or comments through the comment box below or by emailing seniortriathletes@gmail.com. What is it like to do a triathlon in winds gusting to 40 miles per hour (64 km per hour)? The 2015 Bismarck Triathlon showed us just how much wind can influence a race. How to Choose Your Next Triathlon highlights factors we typically consider in selecting a triathlon, especially those involving overnight travel. For Joy and me, one of the keys to out-of-state triathlons has been to combine travel to the event with a visit to friends or family or a place of special interest (e.g. Savannah, Georgia – Hilton Head, South Carolina). Sometimes, we manage to accomplish more than one of these. North Dakota was unique in this respect. Here’s the reason. In 2015, North Dakota had among the fewest triathlons of any state. On top of this, one of the three scheduled triathlons involved kayaking and mountain biking as an alternative to swimming and road biking. Frankly, I was concerned that the one conventional sprint triathlon in North Dakota might eventually become extinct. So, in February, we decided that this would be the year to complete the North Dakota triathlon and put behind us concerns about completing a triathlon in this state. During registration for the event, I learned that I could save $2 on the fee if I shared news of the registration with my Facebook friends. Of course, I took advantage of this. After sharing the post, I learned that one of my friends, Tom Lipp, had completed the Bismarck Triathlon the prior year. I also learned that Tom was now training for Ironman Wisconsin. You can read about his experience training for and racing in Ironman Wisconsin here. Bismarck is actually a twin city with Mandan, North Dakota, home of Harmon Park and the Bismarck Triathlon. The two cities are separated by the Missouri River with Bismarck, the capital of North Dakota, on the east side of the river. Mandan is on the west side of the Missouri River. By the way, did you know that the Missouri River is the longest river in the United States, beating out the Mississippi by 21 feet? And, that’s before it joins the Mississippi River just north of St, Louis, Missouri. Driving to the Bismarck-Mandan area from our Minneapolis, Minnesota area home was about as easy a trip as one can make – start the audiobook, get on Interstate 94 West, and stay on it for just under six hours past the Red River Valley and some of the flattest parts of the USA. We left home on Friday around 10:30 am and set our GPS coordinates for Epic Sports in Bismarck, location for race packet pick-up. After collecting the packet, including the race T-shirt, we checked into the Holiday Inn Express & Suites. 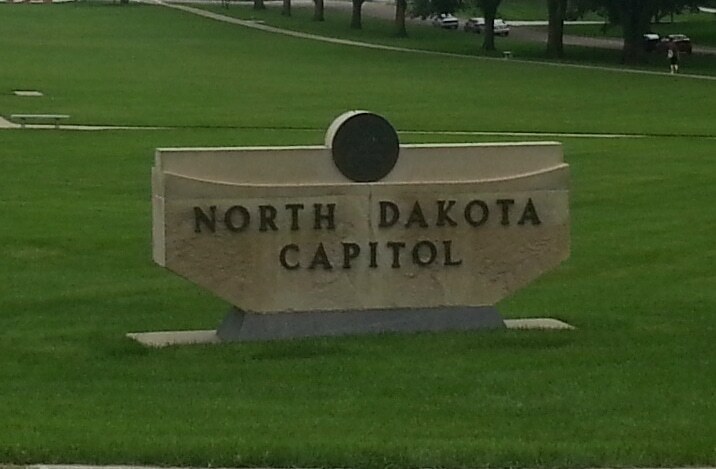 We then headed downtown, taking a short detour around the North Dakota State Capital building along the way. The North Dakota capitol building in Bismarck. Following a short walk around the renovated downtown area, we stopped at one of the restaurants recommended by the hotel desk clerk, Blarney Stone Pub. Dinner tonight consisted of authentic Irish food – creamed cabbage and corned beef for Joy and fish & chips for me. The Bismarck event included sprint and Olympic distance triathlons. There was also a sprint distance relay option in which three members of a relay team each completed one of the legs. The 10 am starting time for the Bismarck Triathlon was the latest of any I have raced so far. The transition area did not even open until 8:30 am, a time at which most triathlons are starting or already underway. Today, however, the air temperature at race time was a chilly 60°F (16°C). On top of this, the wind was howling, with an average speed of 25 miles per hour (40 km per hour) and gusts to 40 miles per hour (64 km per hour). Transition area of the Bismarck Triathlon in Harmon Park. The picture was taken near the beach of Harmon Lake. It quickly became apparent to the poor souls who were assigned the job of placing the race buoys for the sprint and Olympic distances that the wind was too much for the anchors meant to secure the buoys in place. The buoys simply would not stay where they were placed. On top of this, the volunteers in kayaks who were supposed to provide a rest stop along the course for swimmers needing a break during the swim leg had to spend all of their time paddling to trying to stay near the course. With the wind today, it was not possible for them to provide the support for swimmers that race organizers intended. So, just before the start of the race, with the wind clearly in control, the race director decided to shorten the swim course, creating one that ran parallel to the shore a few yards away from it. The revised course, reported to be 250 m by one swimmer with a GPS watch, was judged to be safe for the conditions of the day. Fortunately, everyone was safe through the swim and the remaining legs of the race were completed as planned. Harmon Lake early in the morning before the wind picked up. Note the orange and yellow buoys near the other side of the lake for the sprint and Olympic distances respectively. For the bike leg, the numbers on my bike computer tell the story. The average speed was 14 mph (23 km/hr) while the maximum speed was 37 mph (60 km/hr). While biking uphill, into the wind, the speed was incredibly slow at between 9 and 11 miles per hour (14-18 km/hr). For most of the ride, I avoided the aero position for fear of being blown off the road. After the initial approximately two miles into the westerly wind, we turned. Now, the wind was from the side making the ride even more treacherous. Triathlon training tip – While we may be inclined to avoid inclement weather when training, we should take advantage of these opportunities, at least some of them. Training in conditions, such as rain or wind, which could be experienced on race day, helps to prepare for these when we eventually face them during a race. Reminds me of James 1:2-4. The maximum speed came on the return of this out-and-back course where we road downhill with the wind at our back. I prefer that the run course not include a hill immediately out of transition. The legs are already struggling to adapt to running after biking. But today I was not getting my wish. The run out of transition involved a significant hill on the same road within the park that we had just returned from the bike course. And, with the wind today, my legs were more tired after the tough bike ride. The run was also on an out-and-back course, sharing a section of the bike route. The initial portion took us past the campground within Harmon Park where campers turned spectators cheered us on. As with the bike, we ran into the wind for the major portion of the first half of the run. But just as with the bike leg, the wind helped us back to the finish line after the turnaround. I ended the race with the second best time of five participants in the 60+ year Age Group in which I raced. Nothing to brag about, but no injuries. Another state closer to the goal. First race in which strong winds forced a change in the swim course. Latest start time; first race with a start time of 10 am.